The Glacier Trust is a climate change adaptation charity based in the UK. We are small and work only in Nepal where climate change is impacting the lives of some of world’s poorest communities. We don’t think of people as ‘victims’ or ‘beneficiaries’; we see them as ‘agents for change’. Our role is to enable that change by funding innovative climate change adaptation projects in remote Himalayan communities. Since 2015, through our work with EcoHimal Nepal and the Deusa Agro Forestry Resource Centre, we have been enabling farmers to grow, process and sell coffee commercially for the first time. Coffee grows from seed at a plant nursery in Deusa, Solukhumbu. The nursery owner nutures the young coffee plants before selling them onto local farmers. This photo features Hari Kumar Kharki who is employed by EcoHimal Nepal as part of the TGT funded Sustainable Tree Cropping programme. Here Hari is monitoring the coffee saplings growing at an altitude of around 1,300 metres. TGT funds training workshops where farmers are taught how to plant, grow, pick and process their coffee. When planting, the trees need to be an exact distance apart as coffee expert Bhola Shrestha from HELVETAS demonstrates here. Farmers in Deusa learn to ‘inter-crop’ their coffee trees with other fruit and nut bearing trees. This provides the shade coffee trees need and also prevents unsustainable mono-cultures from developing. Here you can see coffee growing in the shade of large banana trees. Once the coffee cherries have ripened to this deep red colour they are ready for harvesting. Juicy red coffee cherries, picked and ready for pulping. Coffee cherries are fed into a hand-turned pulping machine which removes the fleshy red cherry from the all important bean. TGT has funded six pulping machines for Solukhumbu so far. The addition of this basic technology has been transformative as it means farmers no longer have to pulp their coffee by hand. Once the coffee beans have been through the pulping machine they are hand sorted and cleaned in a bucket. The farmers take care to conserve water as they work. The wet beans are then laid out on handmade bamboo racks to dry. They need to retain some moisture (around 9 - 12%) so have to be carefully monitored over a 24 hour period. Farmers take it in turns to turn the beans to ensure they dry evenly. Once the beans have dried they are ready to transport. Farmers bring them to Deusa Agro-Forestry Resource Centre who buy the coffee in ‘Parchment’ form ready to go to market. The Parchment arrives in Kathmandu where it is bought and then sold by Nuwa Coffee Estate. Nuwa Coffee Estate roast Nepal Glacier Coffee in their state of the art roasting machine, ready to be purchased by TGT to bring back to the UK. The roasted beans are checked by hand to make sure only the finest make it into the final product. Appa Sherpa, head of Nuwa Coffee Estate, hands over the roasted beans to Dr Morgan Phillips, TGT Co-Director in Kathmandu. Finally, back in London, the coffee is re-packaged into 150g bags and sold through the TGT website. 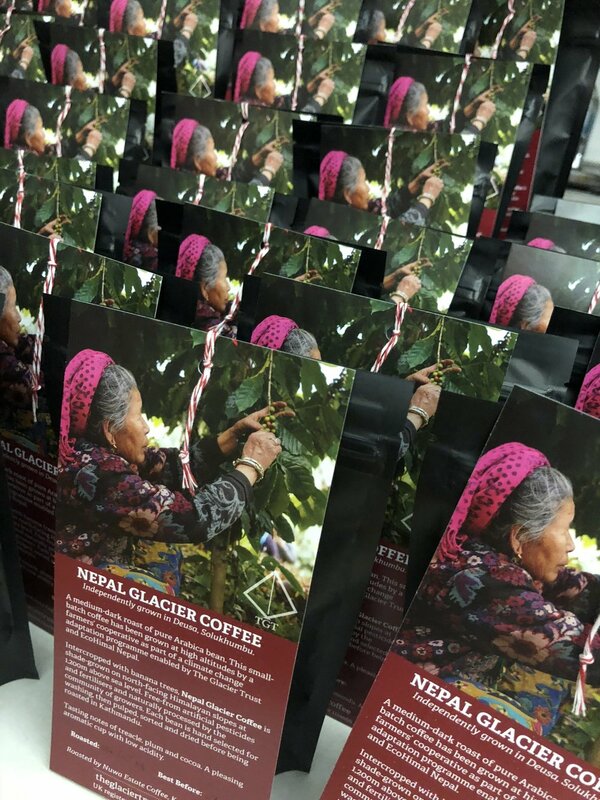 All of the profit raised from selling the coffee (£2 per bag) returns to Nepal where TGT enables further climate change adaptation work. Help us complete the story by sending us a photo of you enjoying your Nepal Glacier Coffee! Please send your images to morgan.phillips@theglaciertrust.org and confirm that you are happy for us to use them on our website and on social media.